The origins of the middle classes have been debated for decades and have been ascribed to many periods of time. Indeed, as far back as the 17th and 18th centuries, there were sections of society that were neither part of the aristocracy nor part of the poor lower classes. 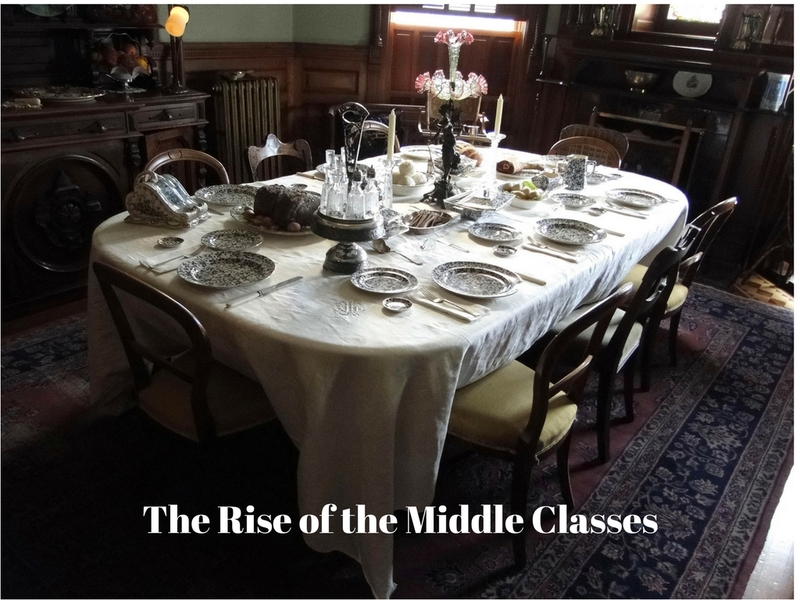 The phenomenal rise in the number of middle-class households, however, as well as the influence they exerted, is undoubtedly a characteristic of Victorian England. As the industrial revolution gained momentum in the late 18th and early 19th centuries, it gave rise to a group of wealthy, educated and important men. Despite their prominence, however, the political and religious orders of the day meant that for the most part, these men had little or no say on the public life of the nation. A situation they ultimately helped to overturn. Before 1832, politics, and most particularly the right to vote, split the country. The only people allowed to vote were male members of the aristocracy and those who owned land or property. Their entitlement was predominantly based on the value of their estates. Anybody who was not a property owner had no right to the vote. Although accurate figures for the early 19th century are difficult to find, a survey conducted in the late 18th century showed that less than 3% of the total population of England and Wales were eligible to vote. Aristocratic landowners, who formed the vast majority of the 3%, were, unsurprisingly, determined to keep the system as it was. They argued that only people with “a stake in the country”, i.e. those who paid taxes and held property, should take part in politics. Before 1832 the voting system was split into County and Borough constituencies. A vote in the Counties depended on whether you owned land or property (a freehold) with an annual value of 40 shillings or more. Voting rights in Boroughs, varied according to the Charter or custom of the Borough concerned. In some Boroughs, the qualification to vote was quite broad. In others, it was so narrow, that only select individuals may vote, often at the direction of the aristocracy. Boroughs, such as Manchester, Leeds and Birmingham, whose populations had grown during the industrial revolution, returned no Members of Parliament. As the 18th century turned into the 19th century, there was increasing pressure for parliamentary reform. Much of it came from the newly prosperous industrialists and professional men (doctors, lawyers, bankers, military and naval officers) who, despite their prosperity and respectability had no political voice. Their cause was aided by the French Revolution and lead radical reformers to demand that all men be given the right to vote. Finally in 1832, to ‘prevent the necessity of revolution’, the Prime Minister, Lord Grey, introduced the Great Reform Act. After much debate and fraught political infighting, the bill sought to extend the County Franchise and standardise the Boroughs. Far from satisfying the calls of the radicals, however, the bill was criticised for not going far enough. Six out of seven adult males were still excluded from voting and the bill specifically excluded women. In addition, all decisions made by the House of Commons could be overruled by the House of Lords. Perhaps the most important thing to emerge from the 1832 Act, however, was that it now distinguished the middle classes from the lower classes. This was largely due to the relaxation of the property laws. The County franchise was extended to include adult men who owned copyholds worth at least 10 pounds a year. Those who had a life interest in, and occupied, freehold lands worth between 2 and 5 pounds a year were also included. In the Borough’s, all adult males who were owners or tenants of buildings worth at least 10 pounds a year (provided they had occupied them for at least 12 months), and lived within 7 miles of the Borough, received the vote. All eligible men had to register annually. By 1867, due to further pressure, it was necessary to extend the voting rights further. The most important change for those living in the Boroughs was the granting of the vote to men who rented properties rather than owned them. As a result, the size of the electorate in some of the newer towns in England and Scotland increased dramatically. The entry of the middle classes into the political arena was accompanied by demands for civil and religious liberties. It appears that the middle classes were now on a mission. In the early part of the century, religion was the other great suppressor of middle-class aspirations. Many of the emerging middle-classes and those with money as a result of the Industrial Revolution were non-conformists (such as Baptists, Congregationalists, Quakers, Methodists and Unitarians). In the early part of the 19th century, however, they were excluded from many national institutions. The Test and Corporations Acts of 1661 meant that in England, candidates for public positions had to receive Holy Communion in accordance with Anglican rites. As such it meant that irrespective of their wealth or property rights, men were prohibited from becoming a Member of Parliament. They were also unable to attend or teach at Oxford or Cambridge Universities. More annoyingly, they were legally obliged to pay a church tax towards the upkeep of the Church of England. In addition, the Marriage Act of 1753 made it impossible to have a legally recognised marriage ceremony if it was not performed within the Church of England, a Quaker or Jewish establishment. At the beginning of the 19th century, among the wealthy of places such as Birmingham, Manchester and Leeds, non-conformists outnumbered Anglicans. They were naturally unhappy with the state of affairs and determined to push for change. It took sustained public campaigns, but eventually, in 1828 the Test and Corporations Act was repealed. This finally gave non-conformists greater access to public institutions. In 1836 the Marriage Act was updated to allow marriages to take place in buildings belonging to other religious groups. In 1868 the compulsory church tax was finally abolished. Having fought for, and won, the rights to be recognised in both the political and religious spheres, the middle classes now had the opportunity to grow and exert their influence. Something they did to great effect. The success of their campaigning lead the middle classes to see themselves as pioneers for change. They firmly believed in a society that was based on merit rather than on birthright. Through educational reform and schemes of civic improvement, they saw themselves as aiding equal opportunities by enabling the working classes to realise their full potential. The middle classes disliked the privilege of the aristocracy as much as they looked down on the lower-class. An example of their influence is seen with the repeal of the Corn Laws in 1846. This legislature protected the price of corn, keeping it artificially high. This benefitted the landowners but caused significant hardship to manufacturers and the urban population who were desperate for cheap food. It took eight years of campaigning to get the laws repealed but was ultimately hailed for demonstrating the political rise of the middle classes. What Defined the Middle Class? It is difficult to define the middle-classes of the 19th century accurately. They were an extremely broad mix of people, largely defined by their occupation rather than their income. For example, a junior clerk, who earned less than £100 a year, was seen as middle-class in the same way as the Chairman of the Board who may have been paid £1,000. The one thing they had in common was that they were office based. They both worked with letters and figures, and both wore formal clothes (including stiff white collars). Hence the term white collar staff. A skilled engineer, on the other hand, might earn more than a clerk. Because he worked with his hands, however, he was irredeemably a member of the lower classes. While a man’s status depended mostly on his occupation, a woman’s status came from her husband or father. The Victorian middle classes can be divided into upper middle class and lower middle class. Upper-middle-class occupations consisted of trades such as bankers, solicitors and large industrialists. They would have incomes from investments or profits of over £1,000 per year. This sector of the middle class was mostly urban, and their sons would be educated at boarding schools and universities. Being able to send their sons and daughters to school was important for them to achieve class mobility. The lower middle classes included small shopkeepers and clerks with annual earnings of under £50. As London started to become a world centre of business and finance, the white-collar world grew enormously. It included clerks, middle managers, bookkeepers, and lower-level government workers. The other defining feature of the middle classes was their values. They had a strong work ethic and believed that through hard work anyone could improve their status, irrespective of their origins. Being respected was one of their prized goals. A key feature distinguishing the middle classes from the aristocracy was their need to earn money. Although it was not necessarily in short supply (certainly not in the way the lower classes struggled to afford the basic things), the need to keep up appearances meant a healthy income was required. To maintain and demonstrate their status, the middle classes had to keep some type of household. It was expected that the family would have at least one, if not more, domestic servants. In the lower-middle-class household, this may have consisted of a general domestic help. In houses of the more affluent, they may have employed more highly trained specialists (such as cooks or nursemaids). If a woman reached her middle-class status through marriage, she was unlikely to have the knowledge needed to run such a house. If there were no female relations to guide her, she may have turned to one of the self-help books that were becoming popular around the middle of the century. Books were produced for men and women to offer advice on how they should behave and manage their households. Perhaps the most famous of these books, Mrs Beeton’s Book of Household Management, was published in 1861. Not only did it contain recipes, it also included everything the middle-class woman needed to know about running a home. Topics included dealing with servants and servants pay; looking after children’s health; how to dress; how to choose friends and acquaintances, receive morning calls or seat guests at the dinner table. The middle-class family followed the Victorian domestic ideal of a loving and hard-working father, a nurturing mother and dutiful sons and daughters. Unlike the upper classes who had nannies and governesses to take care of childcare, or the lower classes who sent children to work from an early age, middle-class children had more of a relationship with their parents. The close proximity meant that parents closely monitored their children who, as a result, had less freedom than working-class children. The parents were also keen not to give children everything they wanted. This often lead to strict discipline and guidelines. Children typically loved and idealized their parents, especially their mother. Because the family usually had at least one domestic servant, the mother had more time to spend with her children. It meant she was involved in their general upbringing and was responsible for teaching them moral and religious duties. The father, however, provided financial support for the family and was the ultimate head of the household. They were often harder on their sons than daughters reasoning that as their sons would one day lead their own families, they needed to learn how to behave. Middle-class men did not marry until their late twenties because of the importance of being financially stable. Other qualities expected of the middle-class family included sobriety, thrift, ambition and punctuality. They were intolerant of laziness. Even when they were not working, they expected their leisure time to be used constructively.